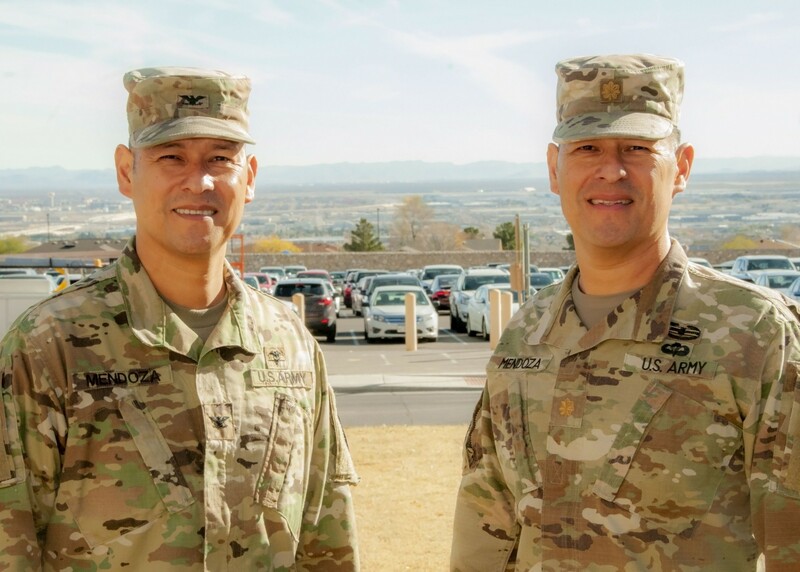 FORT BLISS, Texas -- Eight years since last seeing each other, two brothers from Central Valley, California, cross paths at a remote West Texas location, nestled between mountain ranges and riddled with desert shrub. The setting is all too familiar for the pair, which have spent more years apart than together, yet they gather whenever given chance. James and David Mendoza, fraternal twins born five minutes apart, enlisted after high school to find their calling after gradually realizing their own individual identities, as evidenced by their high school athletics clubs, James participated in water sports while David stuck to running. A desire for something greater drove the brothers toward service after high school, with David enlisting in the Army Reserves while James enlisted in the Army's active-duty component. 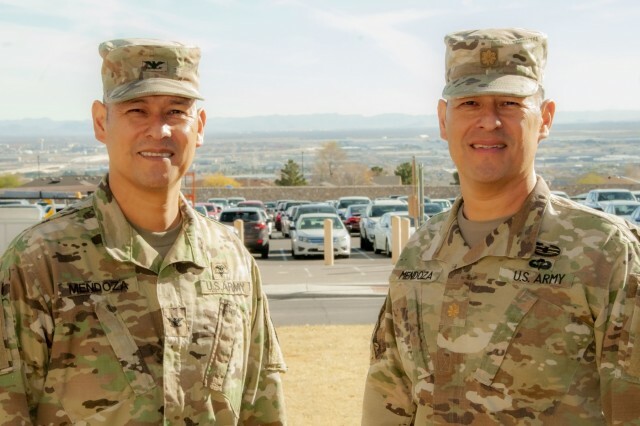 Today, Maj. James Mendoza leads manpower and administrative functions for the 79th Infantry Brigade Combat Team, a California Army National Guard unit out of San Diego, California, while Col. David Mendoza heads inpatient services at William Beaumont Army Medical Center, out of El Paso, Texas. "Last time we crossed paths like this was in May of 2010," said David, deputy commander of inpatient services at WBAMC. "I was stationed at Fort Hood, (James) was mobilizing for a deployment with the National Guard and we happened to be with each other for a few days before he left." Although the brothers occasionally see each other at family functions, such as holidays with their parents back in California, service to country has absorbed the brothers' time. "We're basically two separate worlds now, other than being part of the Army," said David. For James, Army service started as an aviation maintenance technician in the 80s. "As I was progressing through the enlisted ranks I finished up my (college) education," said James, the older of the brothers. "When I got that completed, a door opened to get commissioned, so off I went in the National Guard and started as a finance, logistics and human resources officer." Although James transitioned from active duty to the National Guard, he's remained Active Guard Reserve, or on full-time National Guard duty, since donning the uniform. David's initial Military Occupational Specialty as a combat medic in the Army Reserves inspired him toward earning a nursing degree and commission afterwards. "I don't know a whole lot about the medical world and he doesn't know much about logistics," said James. "There's really not a whole lot that separates us, or that we have in common," adds David. While their desire to become their own person drove the brothers toward service, emulating others who served before them was also a factor in serving their country. "Our dad was a retired Soldier in the National Guard, and we have uncles who served in Vietnam, so we have a family tradition of serving," said David. "Our family background of service and looking for a way to pay for college, possibly get into a career we could use later on in life were motivators to enlist." Their careers have led them through more than a half-dozen deployments, and multiple duty stations for David, but the brothers are still finding time to discuss current and future endeavors with one another. "Life happens. I move around, he stays (in California), and we don't ever get the opportunity to cross paths," said David. "It's nice to have this window of opportunity to hang out and reconnect, if only for a few days." While not having too much in common, both brothers do agree one of the largest challenges they've had to overcome during decades of service are families dealing with deployments. "We share the same sentiments of any military family of having to be gone, (deployments are) a challenge for the spouses," said David. "It's just part of what we do, but it's time away from family," said James. While discussions about life after their service haven't began, the two are glad to discuss the journey they have been through leading to a rare get together for the brothers. "It's great to be at the end of our careers," said David. "It's great to have this time to capstone the last 25-30 years to look back and at the same time look forward."